Collazzi, a beautiful estate of 400 hectares near Florence, in the heart of Chianti, is owned by the mother of Lamberto Frescobaldi. The vineyard, which covers 25 hectares, is located in a dry and sunny amphitheater with a south-western location. It is a beautiful, historic villa designed by Michelangelo Buonarroti. Lamberto Frescobaldi has completely restored the wine installations since 1990. The soil is not very fertile as it contains clay and sand, is rich in lime and has a rocky texture. The grape varieties in the vineyard are rather typical Bordeaux: Cabernet Sauvignon, Merlot, Cabernet Franc and Petit Verdot with small amounts of Sangiovese. The grapes are harvested by hand, after which a strict selection follows, before the maceration with skins can start for 20 days in stainless steel vats. The malolactic fermentation takes place in French oak barrels (50% new barrels). The wine is then kept in barrels for 18 months in the cellar and a year in the bottle. The wines represents the marriage between Tuscan talent and culture with noble grape varieties. While the wines are easily recognizable by their composition, they remain very Tuscan thanks to the mineral and fruity flavors. 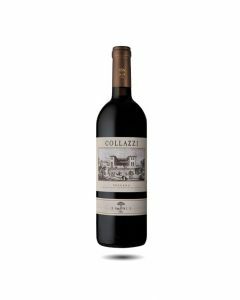 A great value Super Tuscan wine made from a blend of Merlot, Cabernet Franc, Syrah and a small quantity of Sangiovese grapes grown on the Colazzi estate. The wine brings out the best of each of these grapes: Merlot's soft tannins, fresh, red fruit aroma’s from the Cabernet Franc, Syrah’s spicy richness and the elegant fragrance of Sangiovese. The wine owes its name to a donation that the City of Florence made to eight local families, among which the former owners of Collazzi, who had valiantly fought for the city’s freedom. Dark, violet coloured with soft, ripe red fruit flavours, attractive and fresh on the palate with sweet tannins and good balance. As the vineyard grows older, the wine becomes richer and more expressive giving it a lot of personality. Matches well with pasta, tomato sauce, meats and cheeses. Produced on the Collazzi estate just above Florence and grown in the south-western facing amphitheatre of well-drained gravel soils, this is a classic Chianti with great flavours of dark cherries and plums characteristic of the Sangiovese grape. There is freshness and spice from Sangiovese balanced by small amounts of Merlot and Malvasia Nera to round out the wine. Aged for 12 months in used oak, this is a lovely, juicy Chianti to drink young and pair with classic Italian dishes such as spaghetti bolognese, pizza and meatballs in tomato sauce. Drink now for next 2-3 years. The flagship of the Collazzi estate, this super Tuscan wine is produced from a blend of 60% Cabernet Sauvignon and 30% Merlot with small amounts of Cabernet Franc and Petit Verdot; a typical « Bordeaux Blend » but with ripe fruit, elegance and lots of Tuscan warmth and spice. 2015 was a great year and this wine has really beautiful balance and freshness. A great favourite of our team, this is a beautiful wine with flavours of dark ripe plums and blackberries, balsamic notes and fine oak. Serve with meat dishes or aged cheese. Drink now for the next 5 years.